SSR LLC – Feedstock Price Increases – Ethylene’s Friend! Feedstock Price Increases – Ethylene’s Friend! A concern that rising ethane prices are a risk for ethylene producers is misplaced – in our view – as rising costs almost always give sellers pricing power that allows for margin expansion. Further, many ethylene and polyethylene contracts are formulaic and driven by the price of ethane. Consequently, it is not clear to us how any further increase in US ethane costs can be hurtful to the industry. There might be some margin volatility, but in the past, rising feedstock costs have been a positive for ethylene margins and stock prices. 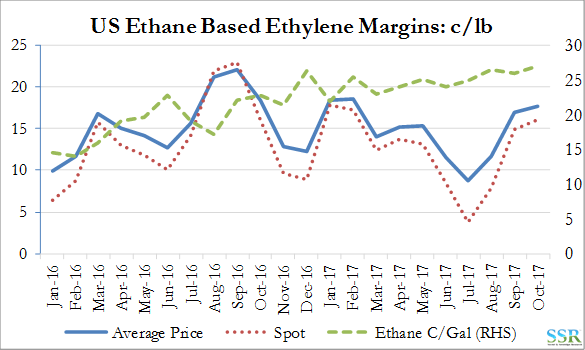 Short-term, and largely driven by the hurricane driven production losses, ethylene prices and margins are rising much more quickly than ethane, with current (October) margins expected to be 7-8 cents per pound higher than August, back to Q1 2017 levels – Exhibit 1. Ethane remains the more attractive feedstock in the US as propane has moved with the better crude market and with some hurricane based logistic constraints. In the meantime, LYB and WLK have the benefit of a widening spread between Mont Belview and Conway ethane – Exhibit 2 – with the October spread the highest since 2014. The current 8 cents per gallon delta is worth around 3.5 cents per pound in terms of ethylene cost/margin. 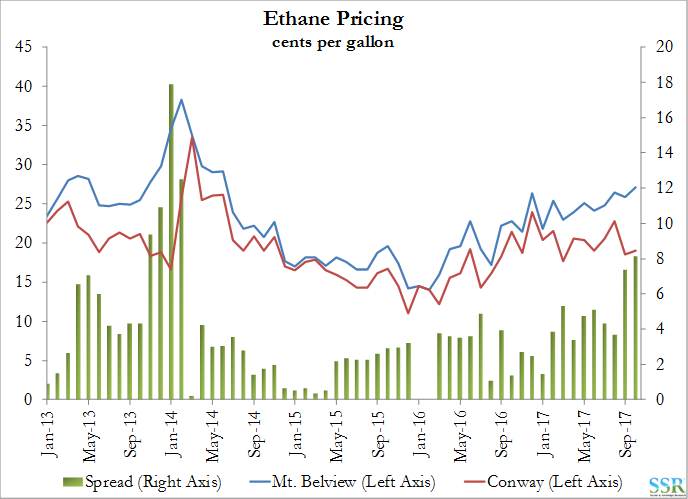 From September 2013 to February 2014 (Exhibit 2) ethylene spot prices rose in line with ethane pricing but then remained high while ethane pricing then declined. In all cases most of the movement came in the second half of the 4-month period, when it was clear that prices were reacting to costs. We have made our position on the ethylene cycle clear – we like LYB, WLK and DWDP.